Background: Edible mushrooms are an abundant source of carbohydrates, proteins, and multiple antioxidants and phytonutrients. This paper presents a general overview on the edible fungus describing the inventions made in the field of its cultivation, equipment and value-added products. Objective: To understand and review the innovations and nutraceutical benefits of mushrooms as well as to develop interest regarding the edible mushrooms. Methods: Information provided in this review is based on the available research investigations and patents. Result: Mushrooms are an edible source of a wide variety of antioxidants and phytonutrients with a number of nutraceutical properties including anti-tumor and anti-carcinogenic. Thus, several investigations are made for cultivation and improvement of the yield of mushrooms through improvisation of growth substrates and equipment used for mushroom processing. The mushroom has been processed into various products to increase its consumption, providing the health and nutritional benefit to mankind. 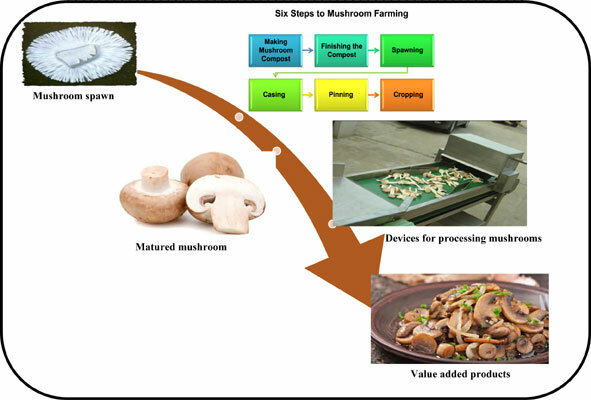 Conclusion: This paper summarizes the cultivation practices of mushroom, its processing equipment, methods of preservation, value-added based products, and its nutraceutical properties. The review also highlights the various scientific feats achieved in terms of patents and research publications promoting mushroom as a wholesome food. Mushroom, nutraceutical, cultivation, equipment, value-added products, unpredicted yield.